The Federal Trade Commission is warning consumers to be alert for credit card skimmers. Skimmers are illegal card readers attached to a payment terminal, such as a gas pump or an ATM machine. Identity thieves can use data obtained from cards passed through a skimmer to make online purchases. 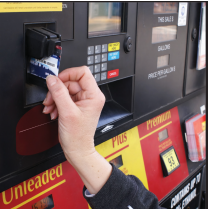 Gas pumps are particularly attractive to thieves because many do not yet use the more secure chip-card readers. Also, newer skimmers are smaller and harder to detect. Thieves can even hide one inside a gas pump. The card reader on the pump looks different from the card readers on other pumps at the station. The card reader feels loose or moves when you touch it. Do not use a pump with a loose reader, and report your suspicions to the gas station attendant. Use a credit card rather than a debit card so you do not expose your personal identification number (PIN) entry. If you must use a debit card, cover your hand when entering your PIN. Choose a pump located where attendants are more likely to see someone tampering with it. It is a good practice to regularly monitor your credit card and bank accounts. Immediately report any unauthorized charges to your bank or credit card issuer.